Lately I’ve been thinking about why I enjoy working with Macs so much. Since switching to Macs from Windows a little over a year ago I’ve tried as much as possible to approach it objectively, calling out both the good and bad as I learned my way around OS X, and recording my findings here in this blog. It’s easy to cite the UI consistency I enjoy with Mac based applications. As a software developer that obsesses with user interface design I have a deep appreciation for disparate applications using similar controls and metaphors. It’s difficult enough for people to understand the underlying tasks and logic a software application can perform, making them learn different control surfaces is like asking someone to navigate through their own family room after you have rearranged the furniture and turned off the lights; lots of stubbed toes and muttered curse words are sure to ensue. Instead of the UI, I’m finding the real draw for me has been how productive I am as a power user. As a Windows user I never questioned the Mac’s user interface. It looked “pretty”, a back-handed compliment if there ever was one. What I did not know, and not a single Mac advocate ever mentioned to me for fear of scaring me away (I assume), was that Macs could channel that inner power user like no other machine could. 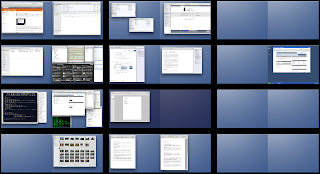 At any given time I’m running a dozen or so applications, many comfortably set up in their own Spaces window. I can switch between the programs by hitting the familiar Command-Tab. If I need to launch a new application I use LaunchBar, without question one of the best productivity tools you can get for a Mac (Quicksilver provides a similar capability). No reaching for the mouse and hunting for the application I want to run; I simply hit Command-Space, type 2-3 letters and hit Return and my application is loaded almost immediately. If the application is already running it just switches to it. My Mac Pro serves as my communications center as well, serving up my email through Apple’s Mail program, AIM and Gmail chat through Adium, my Twitter feeds through TweetDeck and my incoming and outgoing phone calls through Skype. If I need to call a number I hit Command-Space, type “call” and enter (or paste) the phone number I want to dial. If I decide I want to contact someone that’s not visible through Adium I’ll just hit Command-Space and start typing their name. Once their name appears in the LaunchBar menu I can hit the right arrow key and choose either an email address or phone number. If I choose an email address a new mail message is created with them as the recipient and I’m ready to start composing my message. If I select a phone number Skype takes over, gradually muting the John Coltrane track I have playing on iTunes as the phone begins to ring. I hang up the call and the music comes back. Meanwhile down in my development Space I’ve got TextMate (my preferred programming editor), MySQL query browser and three terminal windows open. In one of the terminal windows I have an SSH session to one of my production servers open and am running a tail on one of my logs. The other two terminal windows are positioned in specific directories so that I can quickly execute commands for my Ruby on Rails based application and monitor the debug output from my local server instance. Safari is open in that same Space with the local version of SharedStatus up and running in it. If you are a power Windows user that wants to dismiss the Mac as just a simplistic and trendy consumer machine—something I was guilty of—you may want to reevaluate that position. In my experience I’ve found Macs to be the computing equivalent of automotive sleepers; they look soft and simple on the outside but as soon as you push it you realize it’s capable of extreme performance.